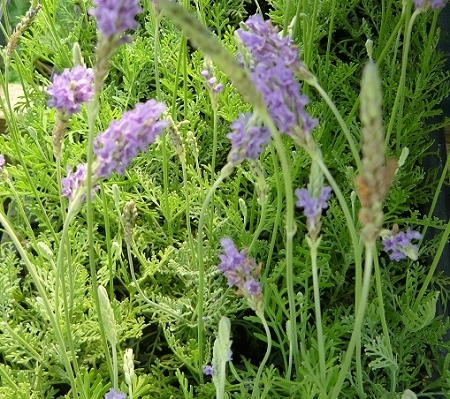 Fernleaf Lavender (lavandula multifida) Also sometimes called fringed lavender. Very attractive lavender variety features silver-green deeply cut fern-like foiliage and deep purple/blue flowers on tall bracts. Long season bloomer. Aromatic lacy foliage makes nice filler material for cut flower bouquets. Southern lavender, can be grown as an annual in cold climates. seems to take hot and humid conditions better than some of the other lavender varieties. Perennial zones 8-9. Live plant in 3 inch container. Compared to other lavenders this one is wispy and fragile-looking. That is a compliment. The aroma and the flowers are just as strong as other lavenders, but looks different. It is a bit shorter in height, but fits quite nicely in an herb container garden. So glad it is back in stock as it is not found in very many garden centers or online.